Ex-Wales wing Shane Williams says Japan's 34-32 win over South Africa in the World Cup was fully deserved. 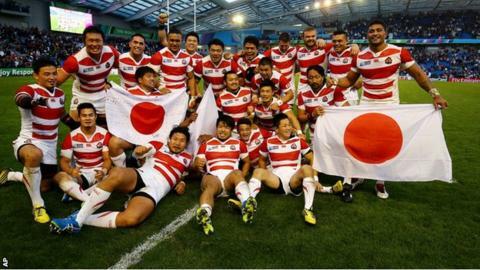 Karne Hesketh's late try saw Japan cause arguably the biggest upset in rugby union history. Williams played in Japan with Mitsubishi Dynaboars and was at Brighton Community Stadium in his role as a TV pundit. "The endeavour and the 'never say die' attitude from the Japanese players was just incredible," he said. "They deservedly won the game in the last seconds of the game. "It's one of the best games of rugby I've seen, not only in the World Cup but ever." Japan had not won a World Cup game since 1991, while South Africa were world champions in both 1995 and 2007. Eddie Jones's side face Scotland in their second game of the tournament at Gloucester's Kingsholm on Wednesday.